This Magic Maze review was made after playing the game more than 10 times. Magic Maze is a real-time cooperative game in which you try to help four fantasy characters steal some adventuring equipment from a shopping mall and escape before time runs out. Oh, and you can’t talk! The game comes with 17 scenarios that you can go through. The first seven slowly introduce all of the rules of the game, and then the last 10 add in additional challenges. 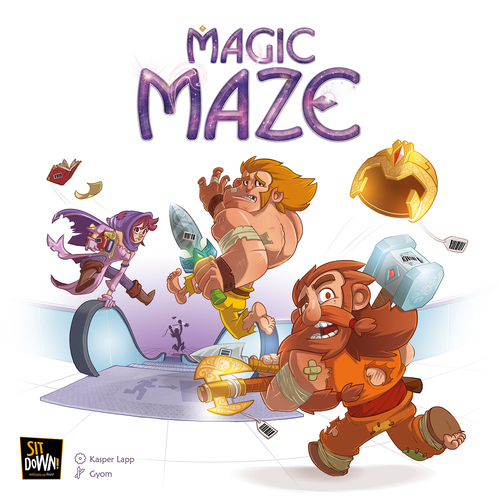 Magic Maze was designed by Kasper Lapp and is punished by Dude Games. It was nominated for the 2017 Spiel des Jahres. To begin a game of Magic Maze, all players will get a tile that will tell them the actions they can take throughout the game. All of the tiles will have arrows telling you where you can move the characters, and most will also have a special action. Your goal is to get all four characters to their special equipment spaces, then get them out of the mall through the exits. All of the characters will begin the game on the starting tile and you will expose more tiles as the game progresses. Once the sand timer is flipped, everyone will work simultaneously to move the characters around the mall, but no one can talk. The only way you can communicate is by placing (or tapping) the large pawn in front of the person who you think needs to take the next action. The tiles you’ll be moving around will have icons on them that tell you how you can interact with them. Each Explore icon will allow the person who has the Explore action to add a new tile, revealing even more icons that you can interact with. The person with the Vortex action can move characters to any of the vortexes around the mall. The last action that you might have is the Escalator action, which allows you to simply move a character up or down an escalator. If you see that time is running low, you can work as a team to move one of the characters to a Sand Timer icon. This allows you to flip the sand timer over and talk to each other until someone takes the next action. After activating a Sand Timer space, you’ll place an Out of Order marker on it, meaning you’ll have to find and use another space for that action if you’re running out of time later in the game. After you’ve gotten past the first three scenarios, character-specific special abilities will be introduced. The Dwarf will be able to pass through small passages that no one else can; the Elf allows players to talk when he explores; the Mage can add two new tiles anywhere in the mall; and the Barbarian is able to turn off security cameras, which are found on new tiles that you’ll use from Scenario 7 onward. 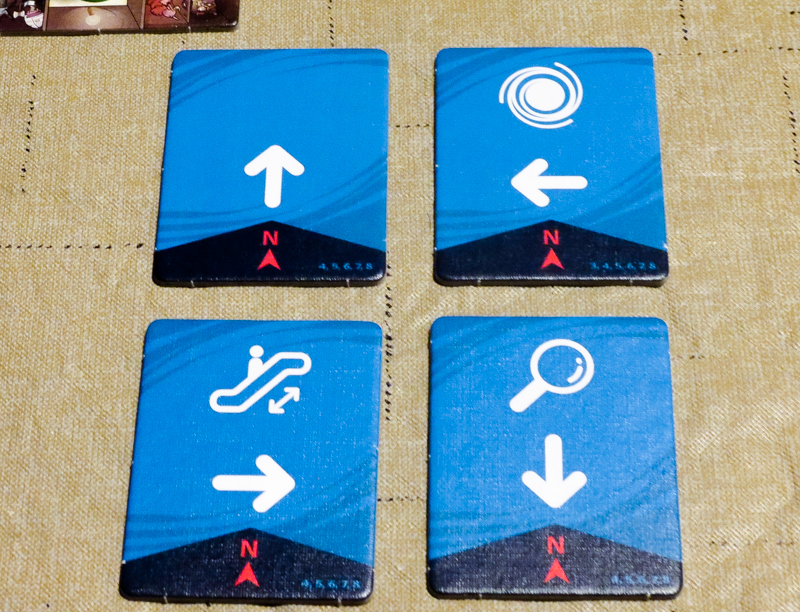 In the first scenario, everyone will have to make it out of the same exit in order to win. In each subsequent scenario, characters will have to make it to their own exits, which are spread out around the mall. If you’re unable to help all of the characters get out of the mall before the time runs out, everyone loses. If your team doesn’t work well together, you won’t win. That’s what I want to say about all co-op games, but the reality is that it’s just not the case with a lot of them. You simply can’t pull off the victory on your own in this one, so (hopefully) each player will try to do their best with the job(s) they’re given. I like that the game slowly teaches how everything works as you play through those early scenarios. 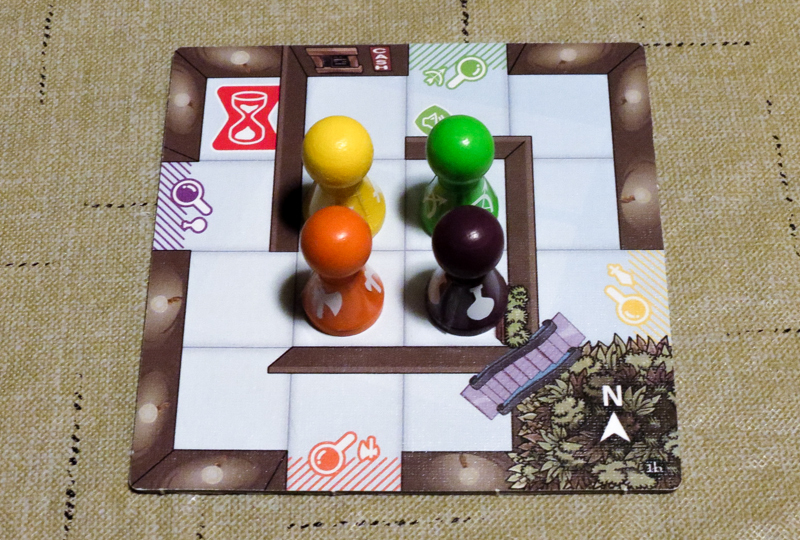 While Magic Maze is probably best at four players, it’s a solid game at all player counts. That’s pretty great considering it goes up to eight. Solo is a bit different than the normal game, but I had some fun with it. I usually don’t like when sand timers are used in games (see our Spaceteam review), but it is definitely necessary in this one and can’t be replaced by a digital timer. In fact, part of the fun of the game is keeping your eye on the timer so you can get as much time to talk as you can before continuing. The artwork on the tiles has a nice, clean look. Some people will absolutely hate that giant pawn. It’s already a tense game and is made even more tense if someone is hammering that big pawn on the table in front of you. As is the case with most real-time games, I do worry about the long-term replayability of this one. My group hasn’t mastered it yet, but we do keep getting better and I’m not sure if we’ll want to play it much more after we’ve consistently beaten the tougher scenarios. I think they chose to use pawns because they’re easy to pick up and put down, but it would have been great if the characters actually looked like characters. The theme doesn’t really make any sense. I think a theme similar to the one used in Professor Evil and the Citadel of Time would have worked well here. 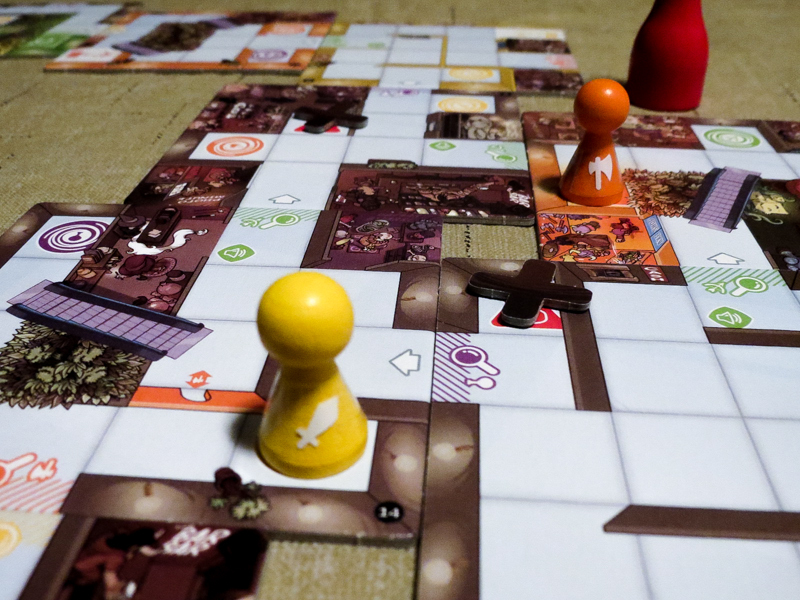 Magic Maze is now one of my group’s favorite cooperative real-time games. It plays quickly, it’s still challenging after 10+ plays, and there are a lot of “Wahoo!” moments when you beat it. It might have been even better with a different theme, but it’s a keeper just the way it is. If your group loves real-time games, you will probably have a blast with this one. If you like games that allow all players to have an equal say in how the team plays, then this is a good one to get. You’ll want to pass on this one if you don’t like real-time games or you try to avoid games that ratchet up the tension. Update: Magic Maze was added to our Top 5 Limited Communication Games list! 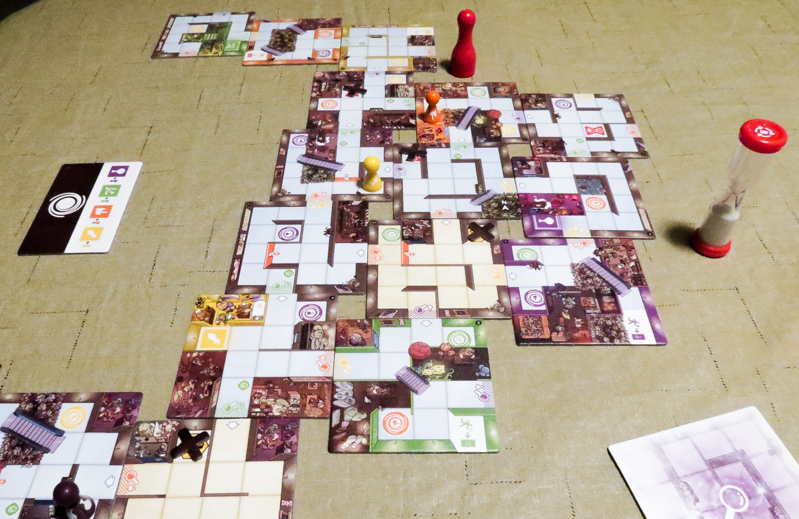 Thanks for taking the time to read our Magic Maze review! To stay updated on all things cooperative board games, follow us on Twitter, Facebook, or via RSS.